I'm well aware that all these sun-drenched, brightly coloured images I've been posting recently are probably getting on the nerves of some of you back home in what appears to be totally abysmal winter weather. As usual, it seems, the UK is in utter turmoil with all its 5 inches of snow. Typical. But in times like these, its best to remember that things could be a lot, lot colder...so here's one to win that sympathy vote and warm those fashion cockles, eskimo stylie. 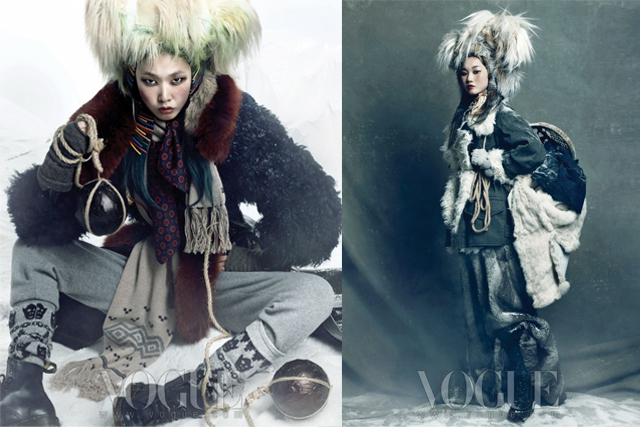 Queen of Snow, photographed by Hong Jang Hyun and styled by Jiah Yi for Vogue Korea, January 2012. 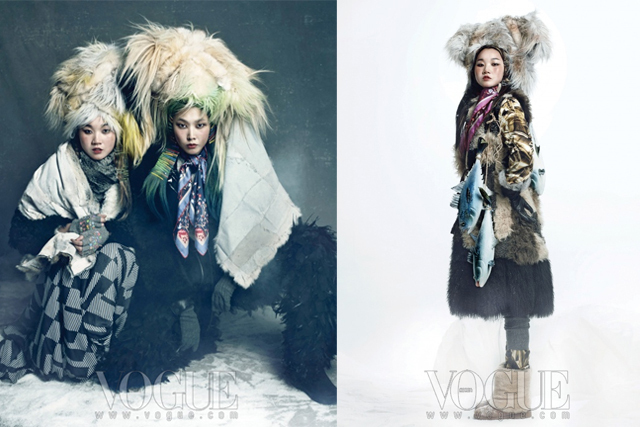 Starring Korean models Han Hye Jin, Song Kyung Ah, and Jang Yoon Ju.